Last night I went to an unusual event in Karachi. Some of the wealthiest people of Pakistan sat next to the poorest, and when I say that, I mean it literally. 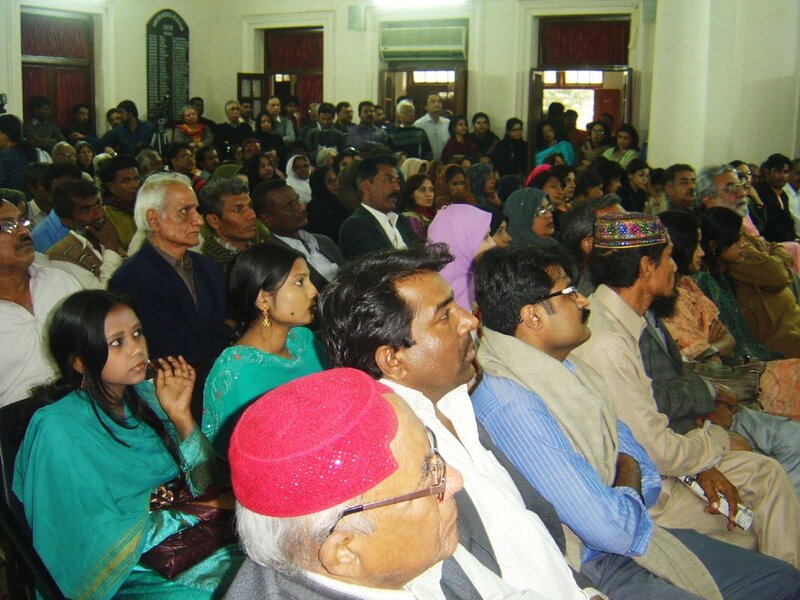 Leaders of the ruling Pakistan People’s Party were invited to speak at the same stage as those of the Muttahida Qaumi Movement and the Labour Party to name just a few at the Pakistan Medical Association House where a couple of hundred sat in attendance. Till a day before, the event organisers, Citizens for Democracy were desperately searching for a venue as at the last minute, citing threats from clerics, the Arts Council withdrew the offer to host a remembrance of the assassinated Governor of Punjab, Salmaan Taseer. I should point out that the Karachi Press Club also refused to allow the event at their premises. Knowing of these threats, there were not forty-thousand, but there were enough to fill the large hall and then some. It was an eclectic mix of human rights activists, independent journalists, politicians, doctors and trade unionists with one thing in common — the awareness that there needs to be a change, and their presence proved that while it may be improbable, it is not entirely impossible. I am not saying that the place was teeming with fearless souls, but it seems to me that there is a direct correlation between power and fear. It appears that the most disempowered politicians are the most courageous. Fauzia Wahab, the Information Secretary of the present government failed to make a definitive statement citing the PPP’s stance on the Blasphemy laws. On the other hand, the representatives of the Awami Party, the Labour Party and the Jeay Sindh Qaumi Mahaz all condemned the assassination of Salmaan Taseer, labeled Mumtaz Qadri the murderer he is, and declared their unequivocal stand against Islamic ‘extremism.’ Of course it may be argued that as these parties do not have power, they have nothing to lose. And yet, there still exists what I understand to be individual moral fibre, which I saw in another representative of the government, Dr Kaiser Bengali, the Advisor to the Chief Minister Sindh for Planning and Development. Dr Bengali, prior to the event stated to me that seeing the large turnout, thought there remained some hope for Pakistan. At the podium, he said the same, and added, “Salmaan Taseer is a great man. I say ‘is’ because a shaheed does not die.” These are mere words but we are not the ones who tote guns and blow ourselves up; words are what we have. Perhaps Ms Wahab should have realised that before she talked at her audience, and maybe then she would have given us words of substance rather than empty rhetoric. Instead of giving us the befuddling advice to ‘unite for ourselves beyond the state, the government, the legislature,’ she should have told us to come together because she and her party were behind us — the party that I was raised to believe, and still hope is the one reliable progressive political force of this country. I have felt that we need to cut some slack to this democratic government elected after a decade of military rule, the prospect of which constantly looms. However, it is an unforgivable lack of governance that we have witnessed in the murder of Taseer and the refusal of the Badshahi Mosque imam to lead his funeral prayers. Ms Wahab suggested that the documentary, Blind Faith, illustrating the abuse of the Blasphemy laws shown by the Citizens for Democracy should be broadcast by all channels. As many in the audience called out to her, I too would suggest to her that she, with all the power we do not have, should show the film on the state-owned Pakistan Television. Or are we to believe what is becoming clear — power only extends to the ability to amass wealth, have noxious entourages and cultivate slobbering sycophants? Beyond that, she, her party and this government are just as powerless as we. Pakistan—that is the only way it will survive. I think the attendance of Fauzia Wahab at the event itself was the necessary symbol of support to the civil society. Please note that the civil society cannot function without a strong, anchoring political party. Do you think it is easy to finish a legacy law, which no one is willing to even reason about? My mother has herself been a target of the the non-sense of this blabbering media. Last year she was accused to have committed blasphemy when she said that during Hazrat Umar’s time there was no constitution and on 7th of January, 2011, after the assassination of a very dear to us Salmaan Taseer, she said on the floor of the house that If Aafia is a daughter of the nation, then Aasia is also a daughter of this nation. Some elements in the media are out to make her life miserable too with headlines like “Salmaan Taseer kay baad, maloona Aasia kee himayat mayn fauzia maydan mayn aa gayeen”. One can have a personal definitive ideology but at a political party level, it is not possible. Everything takes time and with only time people realize the need for change. The PPP has been facing the brunt of the obscurantist forces for the last many years. In the very little pictures I saw of the event at the PMA House, I could see quite a few PPP workers in the audience. Amongst the speakers, I could Iqbal Haider as well as Taj Haider in the audience. These are all known PPP men. On the matter of Blind Faith, I personally saw the videos yeasterday on youtube and believe me, it is something that should be relayed on all channels. Let’s say the PTV doesn’t. Will the other channels that are there to talk of the civil society and human rights play it? No! Please give time to the matter. PPP has lost its people when in power and when not in power. The progressive population has to side with the PPP as it can help lead to our survival and then progress. Thank you for articulating this, much of what was not known to many perhaps. Our grouse, as members of the civil society, is most definitely with the PPP government and its officials. It is true, that the PPP isolated Salmaan Taseer and Sherry Rehman. Rehman Malik and Babar Awan’s statements are proof of it. Nobody else came to their defense either or bothered to clarify Taseer’s stance. And now we see neither the government nor its official taking any kind of decisive action against those promoting vigilantism and hate, or even where Qadri’s punishment is concerned. Why? It is not the duty of the unprotected masses to take this matter up, but of those in government. But since they have not, civil society has been at the forefront, putting its neck on the line. What we would have liked at the reference was for the PPP to articulate a party position and government position, to tell us where it stands on the issue and what it intends to do about it. But that did not happen. We were hoping your mother would do that for us, as we thought she was there as a PPP representative. As for other PPP supporters present at the reference, Mr Iqbal Hadier does not Identify himself with the ruling PPP. He was there in an individual capacity. worker and leader in the shape of Salmaan Taseer’s assassination. PPP is not your enemy. not mistaken, we are talking about the legacy of Zia and his laws? it because either you choose not to see or are not shown the same. elected to the parliament. We can talk here and argue endlessly. Nassim Ally Osman, I’ve reposted the link to the documentary. Please try it now. right wings through back doors.